It has always struck me as remarkable and fortuitous that I am paid to do a job where I get to have so much fun. In my lessons, I have the chance to explore my favourite subject – Physics. Today I was talking about space, time and gravity with my Y13s; on Monday I took my Y9s outside to make a scale model of the solar system on the field. I had as much fun as anyone. Earlier, my colleagues were getting excited that our Cosmic Ray Detector, built over several years from scratch, was sparking nicely. Teaching is full of those moments – if you create them. But it’s not just the joy of teaching your subject specialism – you can do all kinds of other things: play in the orchestra, watch or direct a drama production, go on school trips around the UK and around the world, coach a sports team; get involved in debates; run a Model United Nations; set up a club where students help you do something you want to do – make videos, create a garden, keep chickens, build a go-cart; go on camping expeditions for DofE. And so on. What other job is like that, affording so many opportunities to engage in your passions and to share them with other people. As Chris Husbands, Director of the IoE, said to my students today, education is to the 21st C what oil was to the 20th C and coal was to the industrial revolution. We’re in the business of giving young people the greatest asset in the world economy. We’re doing the thing that transforms lives. It’s a big deal – which is why we spend so much time talking about how to get it right. But, across the wide landscape of careers, this is the ONE. You’re in the right place people. Be happy. We may feel we’re teachers of a subject – but we’re not; we’re teachers of students learning our subject. It’s really all about them – and that’s the joy. Schools are great places aren’t they? I love that sense of being part of something; belonging to a group of people with a shared sense of purpose; a common identity and common challenges. When you are a teacher, you are part of a much bigger project – there’s a vision for reaching audacious goals where you need to play your part. At their best, schools are giant families, offering that sense of togetherness and mutual support. We’re all in it together. At the same time, and increasingly as social media links us all up, we’re all part of a much wider community as teachers. I love the idea of being engaged in a global profession. People are doing what I do in every town and village across the world. Even just within the UK, it’s exciting to think of all the connections we can make with other people doing the same job we do…sharing ideas, working together to improve the whole system, not just our tiny patch of it. School life has a routine for sure… but then it is punctuated with moments of pure joy. These are often when a student makes a break-through. “John, YES – that’s it – brilliant! Say that again…” “You see.. you CAN do it. That’s a really good answer; great piece of drawing; excellent analysis; well crafted paragraph; insightful essay”. These are the great moments…watching a student struggle and then to emerge with a clear grasp of an idea. At Prize Giving today, this struck me. It wasn’t the book; or the cup, medal or certificate – it was just the reward of having achieved that meant the most to them. Not many jobs give you the opportunity so witness achievement on a daily basis in that way. There is never a dull moment in teaching …something is always going on. Of course, there are tough days…it’s a challenging job, just as any worthwhile job should be. But no two days are the same – especially if you teach so that every lesson is a bit of a journey into the unknown. The lessons, events, incidents and interactions with colleagues, students and parents that make up the week demand such a wide range of skills, engaging different modes of thinking: being strategic and planning ahead, analysing problems and finding solutions, being agile and responsive to questions and situations; and, very often, running through a range of emotions, from laughing to crying…it’s all in a day’s work. Of course we all have things we have to do that we’d rather not. But teaching affords a fantastic degree of autonomy. If you choose, teaching can have an strong element of performance about it…you’re on stage, live and in the room with 9M; you can express yourself in a way that you never do around adults. Or, you can be quietly cerebral, wildly eccentric or straightforward and dignified. The classroom is your domain…your space to make things happen the way you want them to. Every lesson is yours to craft, the way you want it…testing out ideas, exploring off at tangents or just keeping it simple. I love that. A teaching career is a never-ending learning journey. You learn more and more about your subject, you learn new skills continually as you engage in new ideas about pedagogy; you develop a broad perspective on social issues and the range of personal challenges people face…the learning goes on and on. You learn a lot about yourself and how your ethical and political dispositions fit with real-life challenges. You learn how to deal with people in every conceivable emotional state; you learn how to communicate a message and how to turn ideas into action. I’m not being facetious. Teaching is incredibly rewarding but also incredibly demanding. But then the holidays come and we deserve them. Generally, teaching is a great job to be in to have a family, to have time for yourself and to have blocks of time to go travelling and to do other interesting things. I never take the bait when my non-teaching friends have a dig because they’re working during half-term or just get a few days at Christmas. Not everyone wants to teach; not everybody could. But those who do, deserve every minute of the holidays. Teachers of the World…let’s talk up the profession. There is no better one. Have a great Christmas/Easter/Summer ! Yes! So eloquently put too. I shall forward this to a couple of Uni students currently studying to become teachers. They’ve chosen well. I’m also tempted to leave it flapping around the school car park for those parents who keep trying to do our job for us because they know better. The oxygen of positivity. Well said Tom. Really well said. And on that note the holidays begin…! You write the posts I would like to write, Tom. Will come back to this whenever I need a lift – and I hope it’s shared and read widely. I know there are challenges, and frustrations, and teachers and school leaders can feel pressured and stressed. But everything you say above is also true, and we need to remind ourselves of it from time to time. Thanks – and this is a well-timed blog! Thanks Jill! Yes, it always pays to count our blessings. You are so right. We make an impact and have a responsibility toward others. I cant just think of a bunch of jobs where you can make a difference to so many people. I was going to write this post (pretty much) myself this evening, but you’ve saved me the job! Great post, thanks for sharing. Pleasure…we all have these thoughts about our job. Was easy to write. It’s refreshing to read. There’s been a lot of negativity, and let’s face it, whinging and moaning, happening in the Edublog sphere recently. I’ve had to stop reading the guardian’s “secret teacher” series as I kept shouting “well leave then if you hate it” at the words. It’s great to see its not just me that still loves the job! Thanks again. I agree about Secret Teacher. Just far too negative. We must not become victims.. especially when the job is so great most of the time. Indeed. I wish they’d stop. There’s cynics in every staffroom and stuff like that just fuels them. On top of that, it probably puts people off, which denies them the chance to do this amazing job and potentially denies our pupils a brilliant teacher. Have just sent this to all my staff as the last thing before putting my iPad away for a few days over Christmas. Thanks. Head teachers do have – despite the stresses – the best job in the world. Just in case we forget. It really is the best job in the world. A great blog from the end of last term from Tom Sherrington, but perhaps even more pertinent as this term gets into full swing! 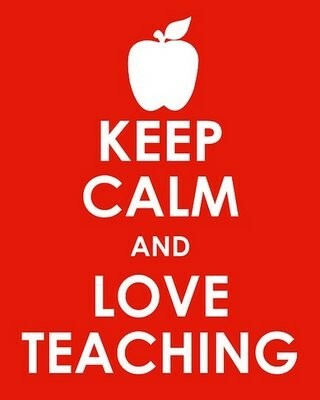 Not T&L focus here, just a timely reminder that this profession is awesome. Enjoy. Reblogged this on Gartree learning culture. CPD blog. Reblogged this on Continuing Professional Development Blog.